Today, thanks to his 40 years of experience, he is one of the most prominent personality in the Italian maritime cluster. 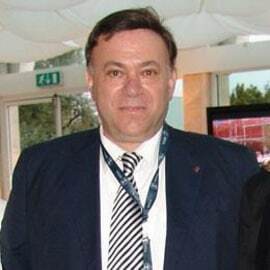 In 1995 he was elected Board Member of Confitarma, the Italian Shipowners’ Confederation and until 2013 he has been first the Chairman of the Oceanic Navigation Committee and then of the Technical Committee, as well as a member of the Executive Committee. He has been a Director of the UK P&I Club (2003-2016), Vice Chairman of Intercargo (2005-2014), Board Member of Intertanko (since 2002) and Member of the Italian Committee of ABS, American Bureau of Shipping (since 2002). He has been married since 1977 to Ghetty Cozzolino, Board Member of the Company. They have three daughters: Mariella, Managing Director and Chartering Manager; Alessandra, Managing Director - Financial Dept, Manuela, Board Member and Legal Dept Manager.